Super Mario Run's World Tour mode is fun, but it's the Toad Rally mode which really provides the game's addictive hook. In this mode you compete with other players to earn Toads which expand the size of your kingdom and grant access to new buildings and items. Taking part in Toad Rally requires special tickets, and if you're looking to play a lot, these run out quite quickly. This robs you of the chance of improving your skills, but thankfully Nintendo has now introduced a feature which allows you to participate without spending valuable tickets - the catch being that you don't earn coins or Toads as a result. Also, enemies defeated in these runs aren't counted towards your total. 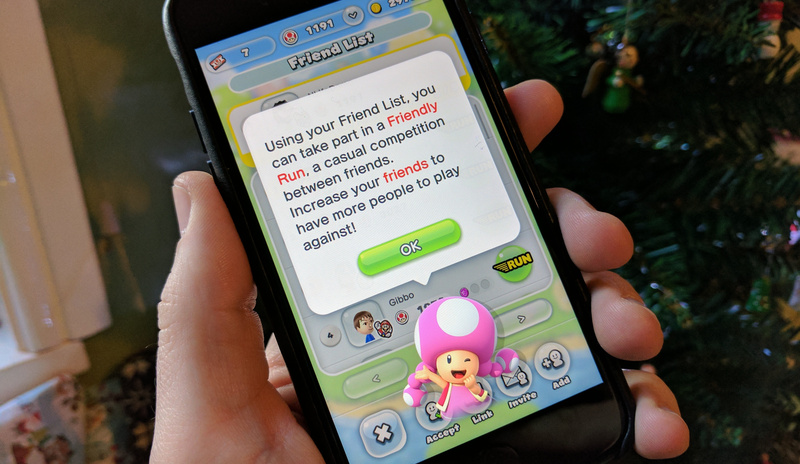 "Friendly Run" allows you to challenge people on your friends list to a Toad Rally, where you can observe their tactics and hone your own talents. While you won't expend any tickets in this mode, there are limits on the number of times you can challenge your pals to a run. If you haven't finished World 1, you can only play once a day. If you have cleared World 1, then your limit is three times. If you've finished World 2, then you can play up to five times. Will you be using this mode to brush up on your coin-grabbing skills? Let us know by posting a comment below. @Joeynator3000 It's a friendly match. What did you expect? Finally a reason to have a Friends List! Not useful at all if you bought the game. You can have 99 (the max amount) of tickets about every day and play hours of Toad Race against those same friends where it does count. I guess it's good for newcomers who want to practice without losing any Toads. @Slaz I'm always running low on tickets though. How can anyone get 99 tickets if they're actually using all of them? The bonus shops only give a very small drip-feed of tickets. @NintendoFan4Lyf You don't compare scores and compete on the non-rally stages? I've been doing that since the first few minutes of play and I go back and forth with friends. For me it is the highlight of the mobile game compared to other Mario games. @aaronsullivan I have checked the scores of some people on my friend's list, but no, we don't compete for higher scores. I guess I missed that point, lol! Just dawned on me. Another added feature since launch in a very fast fashion. It's almost as if Nintendo plans on continually updating the app like they knew they'd have to. I only bring it up because of that "insider" who said no more updates. Probably it meant no new level content or new stages... but I'd still bet on new stages as well. Apparently, Nintendo just announced that 40 million downloads happened in 4 days. This is way faster than Pokemon GO downloads for instance and only available on Apple devices compared to all smartphones for GO. Conversion rate is low, but I'm waiting to see what happens over Xmas. For me and mine we are waiting for potential iTunes gift cards. Sadly, it looks like what I expected but hoped against: people don't want to pay $10 for a mobile game upfront. They want to slowly bleed $50+ into a game with gambles and compromised play mechanics that rely on wrestling with money vs. time in the middle of play. I want that stuff out of my gaming personally, "The price is paid, now I can just enjoy at my leisure."' There's this huge swath of people who play games on smartphones who don't even know how much better it can be. In my book at least, Nintendo is a hero for trying to change things. Looks bleak, though. Let me just get this out of my head too: Super Mario Run seems like a game that was made to be free-to-play with micro transactions. The whole set up is there. My guess is that Nintendo and Apple got talking about it. Apple would much prefer upfront pay and/or a better pricing model as the race-to-the-bottom pricing just fills the store with fodder. Nintendo sees eye-to-eye on this having entered even into DLC reluctantly and under financial stress. They probably decided to make a deal and see if a change could be made. The evidence is the advertising from Apple on the App Store page is unprecedented. At one point it was plastered across the top and every item in the carousel was filled with a different Super Mario image, phrase and link to the game. Never happened before as far as I know and wouldn't happen with just cash. It takes a deal and something Apple believes in for that to happen. @Jaredfrogman Now you're talking! Well, I'm a bit more lighthearted about it, myself, but come on! You don't want to knock that friend of the top of the list when they only beat you by a point or two? Show some ambition, amirite? @aaronsullivan I read some of the reviews and it is truly a sad place. I think the 1-star reviews are a little ridiculous since they are simply basing it on the price and not the game itself. I haven't bought it yet myself - I am going to wait until after the holidays when all of the holiday money hemorrhaging ends and things stabilize. One reviewer boiled everything down nicely on what exactly that $10 gets you, and it's actually a lot - between the "multiplayer" aspect, the Kingdom Builder, and 3-stage challenges (the coins) per level, that's a lot of gaming for $10. I just recently finished out all the coin challenges for World 1-1, and I was quite impressed how the level changed slightly with each coin challenge. I just expected different locations of coin placement, I didn't the level layout to change slightly! There was A LOT of thought put into each challenge! Friend list? Ohh boy, here we go. We all know what's next. Mario is going King on our collective rear end. 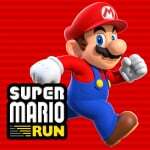 Enjoy Super Mario Run Saga. Hmm no, it's the World Tour which provides the addictive hook for me. I barely play the Toad Rally, hence why I'm quite literally always at 99 tickets. I'm too busy trying to get all the coloured coins to care about how many toads I have tbh. But this is great because when I do play I hate trying to collect coins on the ghost house levels. So it gives me a chance to practice without losing toads because I get stuck trying to find a way to get into the right door. After building the question mark blocks and all the bonus houses my tickets are pretty locked at 99. @Damo The big coin blocks give you like 20 and 10 tickets each day, maybe more. Plus in the bonus game where coins come up from a pipe you can get at least 5 easily. The game gives out tickets like it's candy! I've been abstaining from getting all black and purple coins just so I do not loose the 2 tickets you get as reward. @aaronsullivan I believe Miyamoto said in one of the interviews that Apple actually tried to convince them of the benefits of free-to-play, it was Nintendo who was set on making it paid upfront. I don't recall the exact words, but I think it's in the interview NL posted was available as a download on iTunes. @nab1 I had to admit I've hardly been focusing on getting structures in the kingdom, had no idea! How do you add friends ? @nab1 I recall something like that as well and it certainly balances my theory differently (off the scales?). Now I want to see that, but at the moment I should be doing other things than commenting on here much less looking that up. @Damo From the Bonus Games Huts (Red, Blue, & Yellow) and the ? Blocks (Small, Long, and Large), I can get an upwards of 150 a day if I'm good. Plus, there's the Coins to grab which give you 2 tickets each time you get a set. @hieveryone You can link your Facebook and Twitter to find mutuals who play the game, or exchange IDs (friend codes) with someone. They said friends from Miitomo would carry over and then they didn't, hmm. @aaronsullivan Haha, I hear you, I probably should be doing other things as well But there's an audio version of the interview in iTunes, I just streamed and listened to it during work. @nab1 Didn't get to listen to it yet which is a bit crazy because I listen to podcasts on part of my commute every day. Had to fit in Rogue One Catalyst audio book lately though and then I'm on break. Anyway... here I still am. @hieveryone: You have to exchange your Player ID with them, which is listed in the Add Friend screen. Mine is 9476-6102-2550, if anyone want to add (and earn themselves some Rewards Coins). You can also "Link" through Facebook and twitter. The bigger point to Friends Rally, as noted by aaronsullivan above, is that Nintendo is manning the ship and updating SMR. Loving that Christmas tree in my kingdom (and look forward to friends rally)! @nab1 I can confirm that I got 50...yes 50 rally tickets from the Mega Block when you can carry up to 99. Why is there a limit? @Furealz Yeah, the limit is pretty much pointless, but at least we know you pretty much have unlimited tickets if you just play the game. EDIT: I guess some people might play more than 150+ rounds per day (assuming you start with 99 and then get 50 from the block), maybe it's to prevent server load from those really devoted to it, or potentially bots. There's only so many toad rallies you can ay each day if you only spend an hour or two on it. I sit quite high all the time. Preventing me from grabbing coins as I don't want to waste tickets I earn. I may cave after I get all toads for all unlocks. I wonder what the max kingdom level is. I'm getting much lower ticket rewards than some of you, today I got 10 from the big block, 5 each from the long & single block, 1 from the ghost house bonus, 0 from the matching blocks bonus & 3 from the pipe bonus game. That's only 24. I guess I might get a bit more if they recharge again today. Are these particularly low? @Joeynator3000 You just described all of video gaming. It's all a waste of time, which is the whole point. @Joeynator3000 Fighting friends is its own reward. @bluedogrulez i send you friend request! @hieveryone : great! Are u Abba or Joac30? @Damo Hmm, it may differ per person depending on how much you play. I used to play about 30 to 50 Toad Races when the game came out. That's about the only time I ran low. Then I started to finish the World Tour mode with all colored coins, and that mode literally drowned me in tickets. 2 per colored coin completion and some more for world completion (if I remember correctly). Once you get enough colored Toads, you get these special blocks and minigames you can use to get more tickets everyday. The big block gives 10, the small ones usually 5 (if not just coins). The minigames could give you another 10 to 15 tickets. So as long as you aren't playing 20 to 30 Toad Races a day, you can safely gain more than you spend.